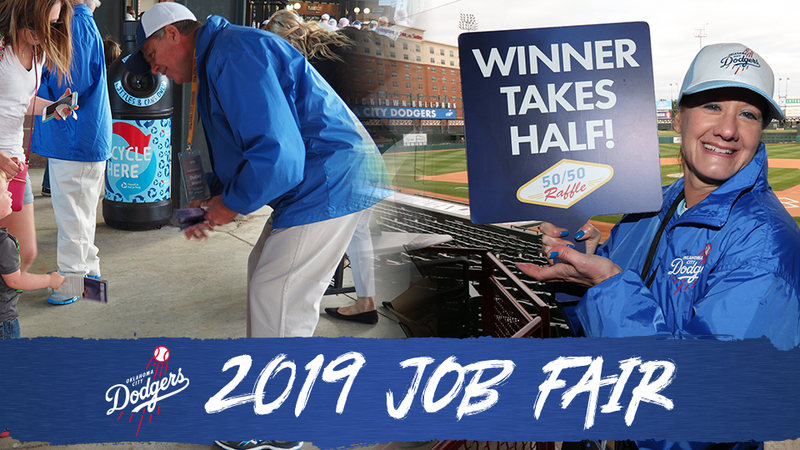 OKLAHOMA CITY - The Oklahoma City Dodgers will host the team's annual job fair for 2019 customer service staff and food service staff on Thursday, February 21 from 4-8 p.m. and Saturday, February 23 from 12-4 p.m. at Chickasaw Bricktown Ballpark. The Dodgers are seeking multi-talented, highly motivated team players. Available positions include ushers, gate attendants, ticket window attendants, retail workers, field crew, cashiers, cooks, kitchen/stand managers, premium-level wait staff, team store staff, janitorial staff and much more. There are also hospitality internships available. A full list of open positions can be found below. "Each event we host at Chickasaw Bricktown Ballpark is a large-scale operation," said OKC Dodgers President/General Manager Michael Byrnes. "We typically have around 250 gameday employees working during our home games, and the people we hire during our job fair are the ones on the front lines assisting fans and providing a level of unsurpassed customer service." The job fair will be held in the Legends Lounge at Chickasaw Bricktown Ballpark on both days. Interested job seekers should enter the ballpark through the glass doors adjacent to the team store located on South Mickey Mantle Drive. Those applying for any position must be available for all 70 Dodgers home games as well as other events held during the baseball season. All applicants must be at least 16 years of age. For more information on the 2019 OKC Dodgers job fair, visit okcdodgers.com or call (405) 218-2154.